these jobs through online mode only. 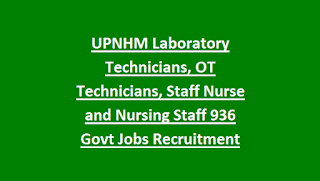 The official website of UPNHM for applying Laboratory Technicians, Staff Nurses, OT Technicians, Nursing Staff jobs is www.upnrhm.gov.in. The online applications are available from 01-10-2018 onwards. The last date for submission of application form through online is 14-10-2018. The candidates will be shortlisted based on merit in written examination. For more information of age limit, pay scale/salary, educational qualification, application fee and how to apply online are given below for Laboratory Technicians, OT Technician, Staff Nurse and Nursing Staff Jobs in UPNHM Recruitment Notification 2018. 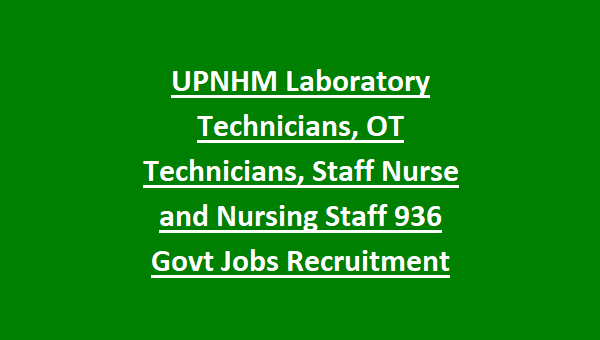 There are total 936 available vacancies for Laboratory Technicians, OT Technician, Staff Nurse and Nursing Staff Jobs in Uttar Pradesh. The age limit for General/UR category candidates is in between 18 – 40 years as on 14-10-2018. For OBC Category relaxation is 3 years. For SC/ST Category candidates the upper age relaxation will be up to 5 years. For PH Category candidates the upper age relaxation will be up to 10 years. For OBC (PH) Category candidates the upper age relaxation will be up to 13 years. For SC/ST (PH) Category candidates the upper age relaxation will be up to 15 years. The education qualification for the Laboratory Technician, OT Technician, staff Nurse, Nursing Staff jobs is based on Jobs category wise given below. Laboratory Technician (LT) – B.Sc. (MLT) or 10+2 along with DMLT. OT Technician (OTT) – B.Sc. (Operation Theater Technology) or Diploma (Operation Theater Technology) with 1-3 years of experience in relevant field. Staff Nurse (SNNSN) – B.Sc. Nursing or Post Basic nursing or General Nursing and Midwifery (GNM), Should have valid RNRM number and minimum 2 years of experience in Labour room/SNCU/NBSU. Nursing Staff (SNSN) - B.Sc. Nursing or Post Basic nursing or General Nursing and Midwifery (GNM), Should have valid RNRM and minimum 7 years working experience as Staff Nurse. Salary offered for the selected/shortlisted candidates is based on post name wise given below. Laboratory Technician (LT) salary is Rs.14443/-. OT Technician (OTT) salary is Rs.15656/-. Staff Nurse (SNNSN) salary is Rs.18150/-. Nursing Staff (SNSN) salary is Rs.25569/-. Candidates can refer in the Official Notification for details of application fee. The candidates will be shortlisted based on their performance in written test. Candidates selected in the written test will be called for document verification. For exam pattern and syllabus candidates can check in the Official Notification of UPNHM. Interested candidates can apply for these posts through online mode only. The official website for applying these post through online is http://www.upnrhm.gov.in/ or http://www.sams.co.in/. The online application forms are available from 01-10-2018 onwards. The last date for form submission through online is 14-10-2018. Candidates should be registered from Uttar Pradesh State Medical Faculty at the time of online submission of application form. The shortlisted candidates will be called for written exam and written exam date will be conducted on 04-11-2018 (Sunday).